As we all watched the dropcash campaign overflow, Solidarity in Style became the Onet community's event. My friend Lars managed to have a peacetiles mural delivered for the dancers. Invisible Children - who I'd discovered through Onet - was involved. I later posted pictures and reports from the Solidarity in Style event for the community to see. In a subsequent peacetiles workshop, the kids from Gulu made a thank you mural of tiles that I delivered to the people who contributed at the Onet community conference in Chicago. Lots of good stuff, all inspired by giving children the opportunity to dance. Dancing breaks through our human barriers. 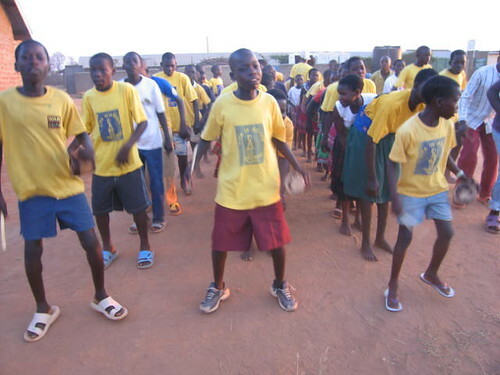 One of the more successful member driven activities at LiA was the Talent Discovery group, who raised money online for drums, so that they could dance together (cross-tribally) in the LiA garden a few times each week. When my sons attended a week long LiA 4 Kids program last year, it was through dancing that they found a gap in the cultural barrier and made good friends. When N. took me dancing for the first time was when I knew I was in love with him. I think that when we can free ourselves enough to dance around the house alone or encourage others in our immediate surroundings to dance with us, it's one of the purest forms of good clean fun there is. So dance with the wwworld today, and be free! An Australian friend who lives in the Middle East sent me a link recently that I absolutely love. Though I'm sure many of you have seen this already, I'm sharing it for your dancing pleasure. Wow. Imagine getting paid to travel the world and the wwworld getting people to dance! Now that's a job I could live with.